Hey all! Just a quick post to inform that I've got three pieces of writing in the new Grapeshot! If you're on campus, go grab a copy or ten - it's free. I got an article in Grapeshot, my university's student publication! 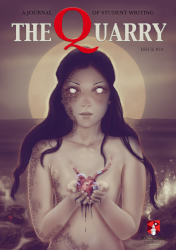 It's Issue 6, Volume 9: Worms. Hey, everybody. I thought I'd share my Major Work from Extension 2 English, which I did in 2012. It actually made it into the Young Writers Showcase 12, which is a collection of the best major works from the year. I'm not saying mine was one of the best, but... Would the Board of Studies lie to you? It's a collection of short stories set in a dystopian future in which copyright law has become a controlling factor in the world. I think it's kind of neat.